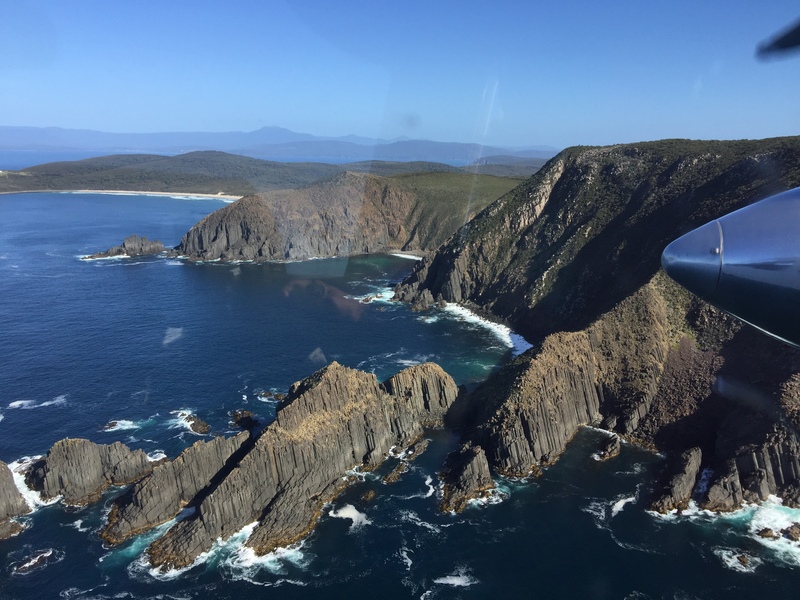 A three day fly-in trip to Port Davey in the South West of Tasmania! How times change. 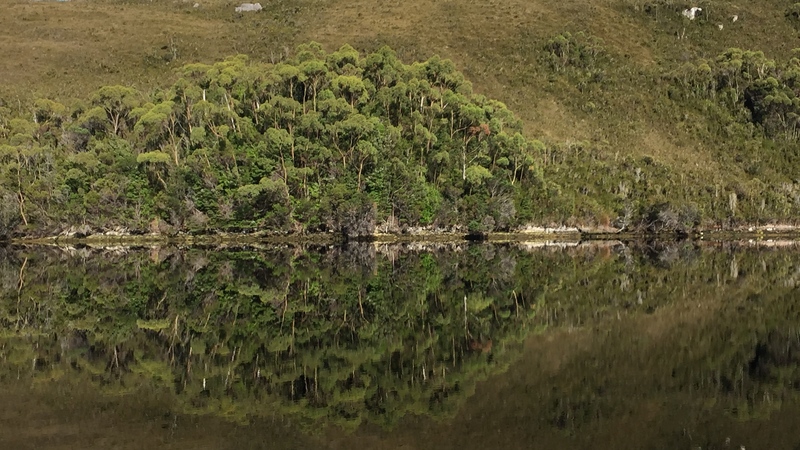 Previously seen only by a few hardy walkers, sailors, whalers, sealers and miners, this area is now easily accessed: take a Par Avion, 3 day Wilderness trip and fly-in from Hobart, see the best sights of Southern Tasmania, the well known mountain ranges such as Federation Peak, and walking tracks including the South Coast Track and the one into Lake Pedder. 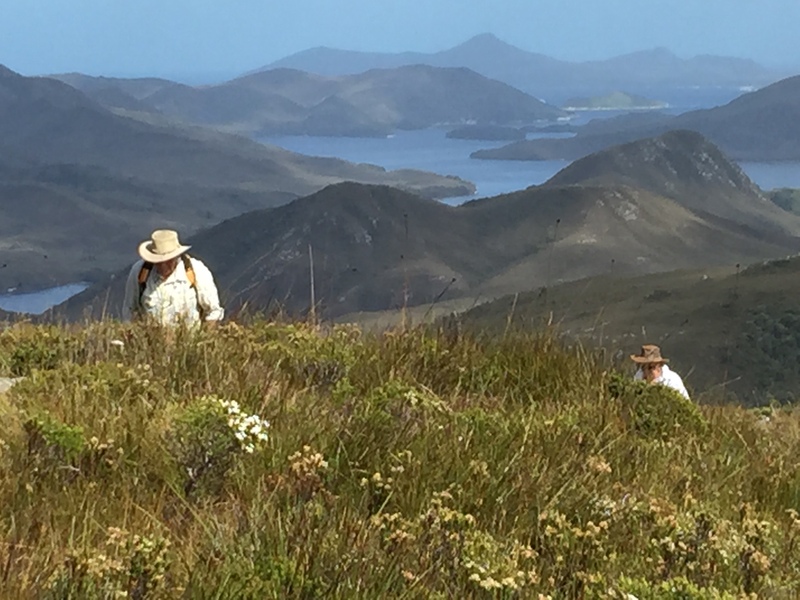 Travel around the huge Port Davey and Bathurst Harbour area by boat, walk up and down mountains, sleep in a comfortable tent camp for two nights and eat very good food excellently prepared and served by the wonderful guides who are so knowledgeable about the history, geology botany etc etc of the region. Go! Strongly recommended. Photos and more comments below. 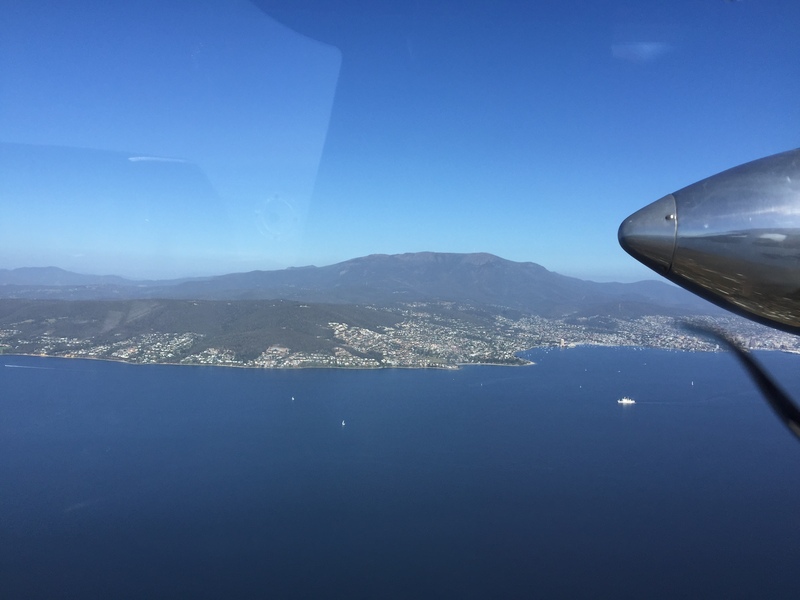 The trip started at 8.00am on Tuesday morning (9th February 2015) at the Par Avion counter at Cambridge Airport, Hobart. The many people milling suggested more were travelling with us than we’d expected. ‘We’ is Diana and I. We met as we walked many km with camels through the Simpson Desert in August 2014. 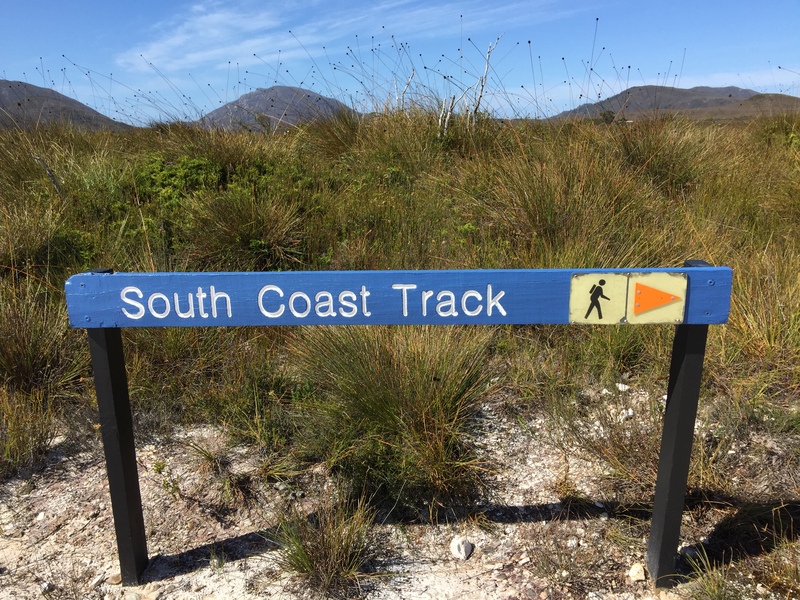 The differences between that trip, to a warm dry desert area, and one to the wet, rugged coastal region, exposed to the Roaring Southerly winds, are obvious. Many of the others in the airport were on a day trip to the South West, leaving me, D, a couple (V and G), and our two guides, Peter and Greg, for the 3 day trip. While waiting I met Jill, a member of the school hockey team we lost to in a Tasmanian state final in 1967! 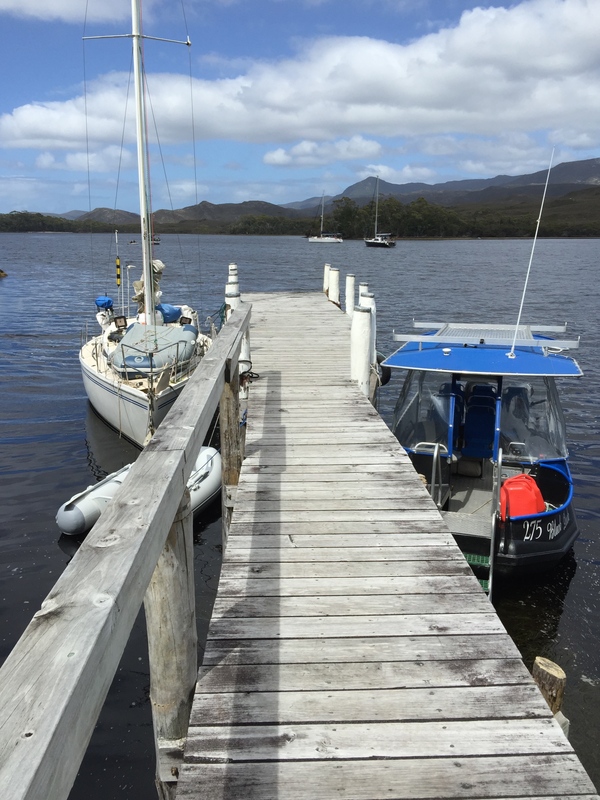 Could only happen in Tasmania….. And no, we didn’t know each other beforehand. The outbound flight, in a 2 engine plane, left at 9am. 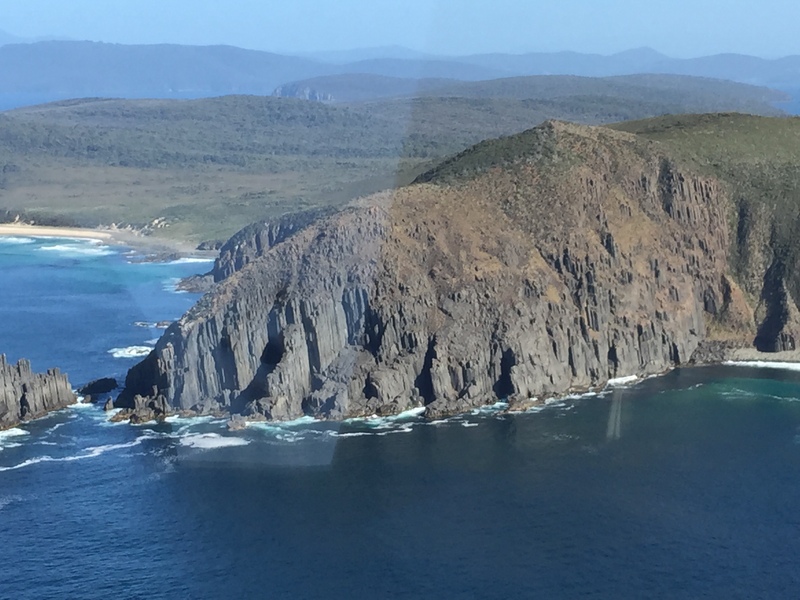 We headed south down over the D’Entrecasteaux Channel between Bruny Island and mainland Tasmania. 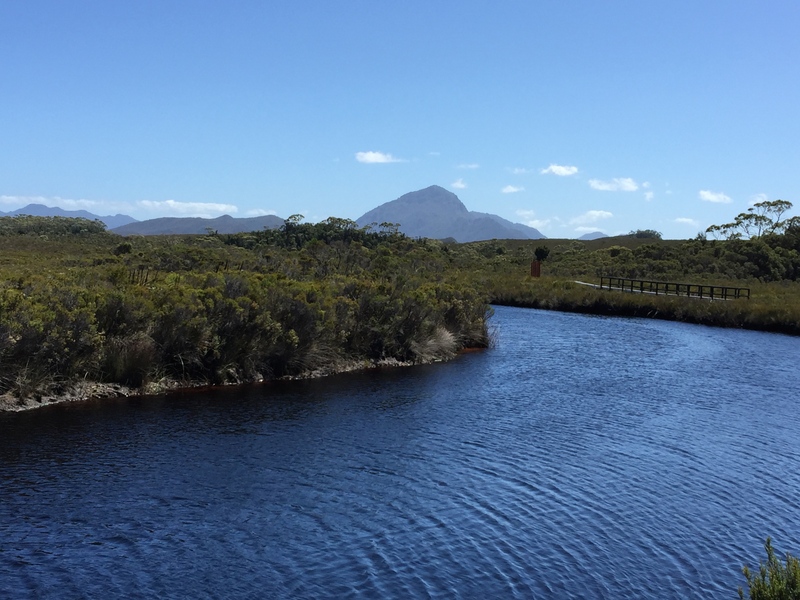 We continued over South Cape, the southern most part of Tasmania, on and around to Melaleuca. 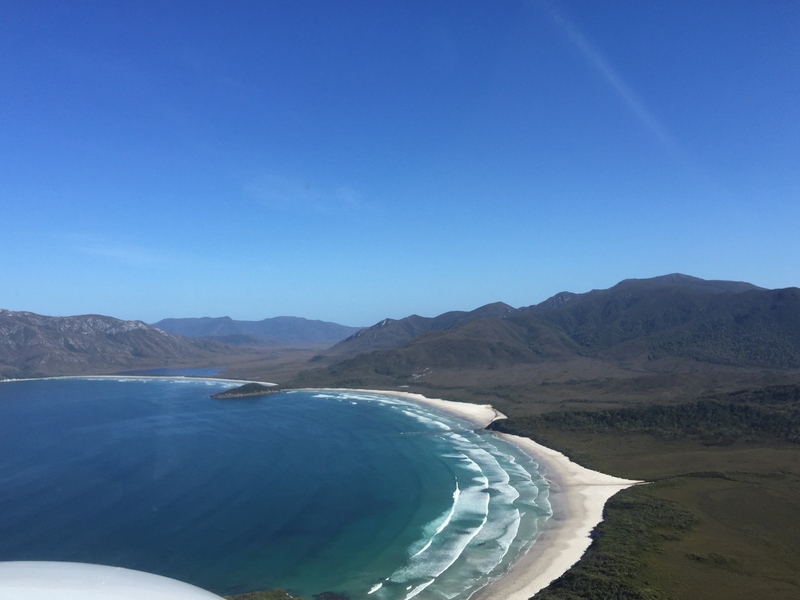 We flew over beds of giant kelp, farms and small towns, gradually heading to the very different vegetation and rugged mountains of the South West. 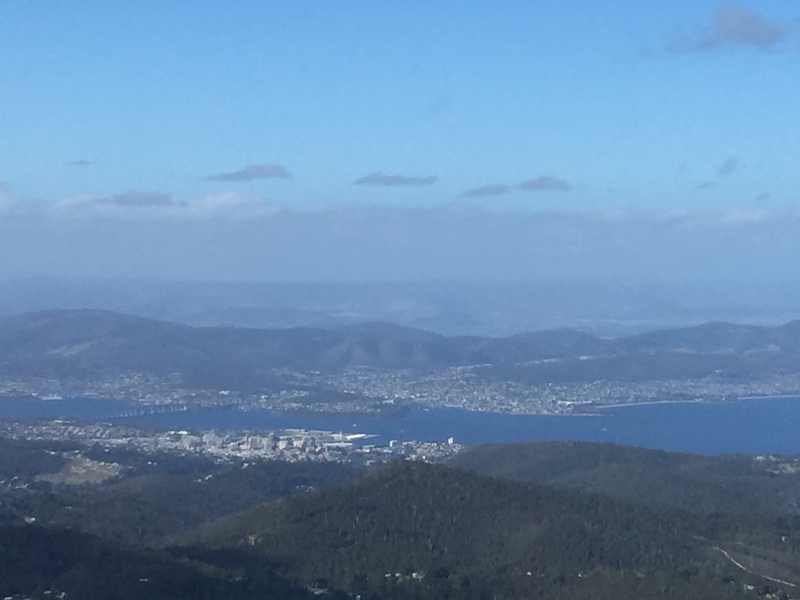 A vastly different looking area from our starting point in Hobart. 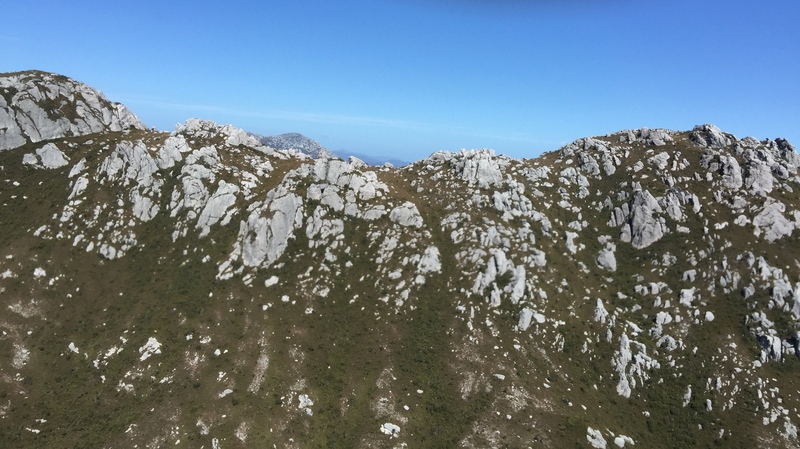 The following photos are taken from in the plane. 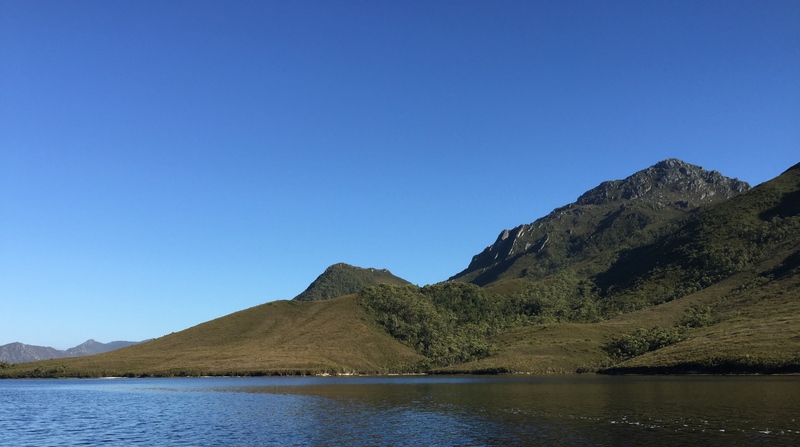 Melaleuca is a postcode-less settlement with a few people there through most of the year but no permanent residents now. Only a short look around was necessary at the airport. 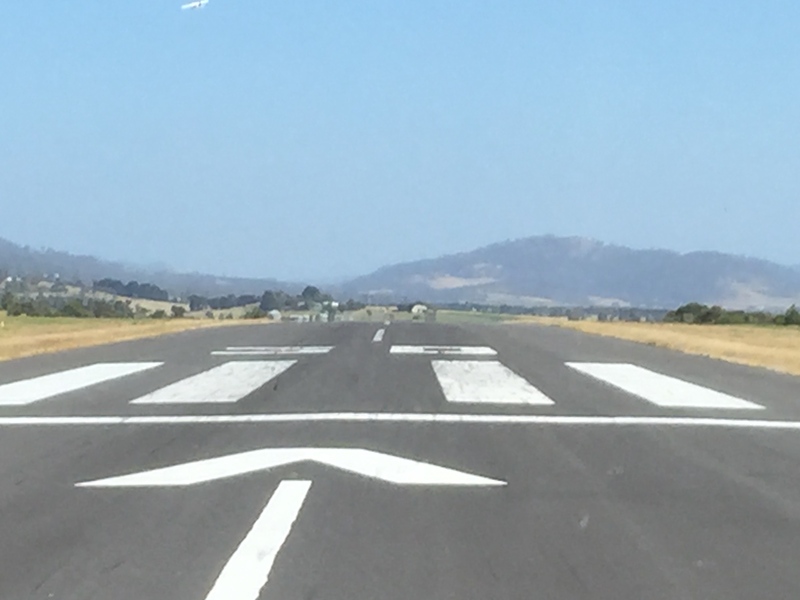 A gravelled runway and a single shed plus 3 other Par Avion planes and a few people. 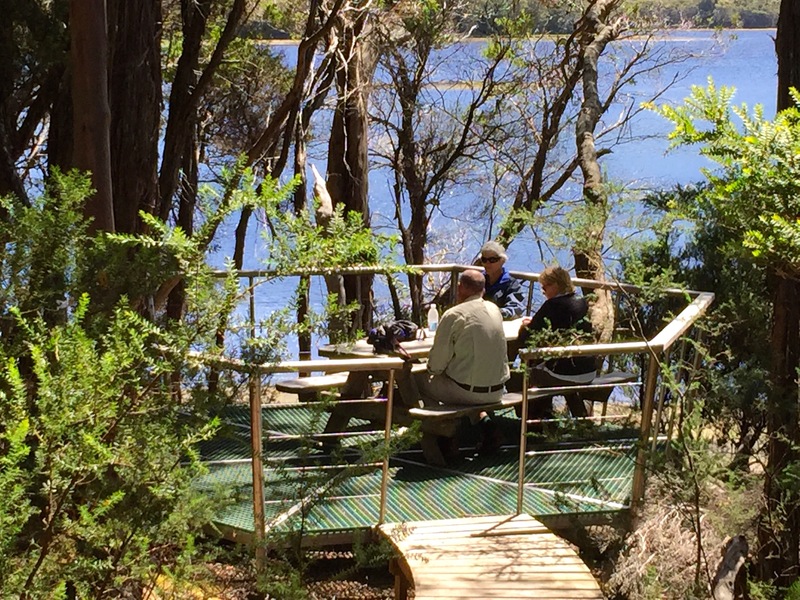 Some were volunteer birders working with Tasmanian National Parks and the rest, like us, temporary travellers to the area. The others were on a half or full day trip only. 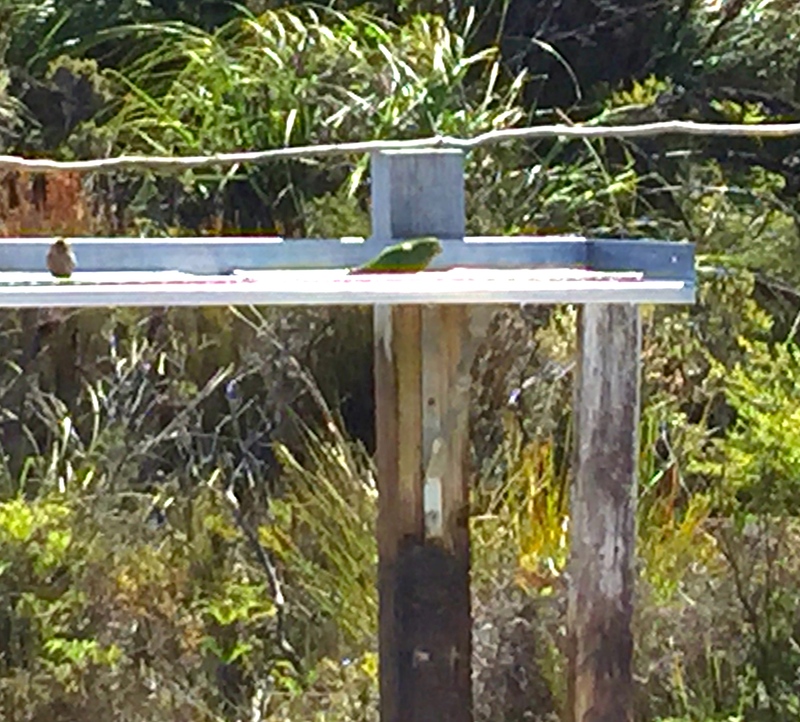 Some highlights near the airstrip: a visit to a small hide to see an orange bellied parrot feeding at the time (one) and to the Willson’s house. 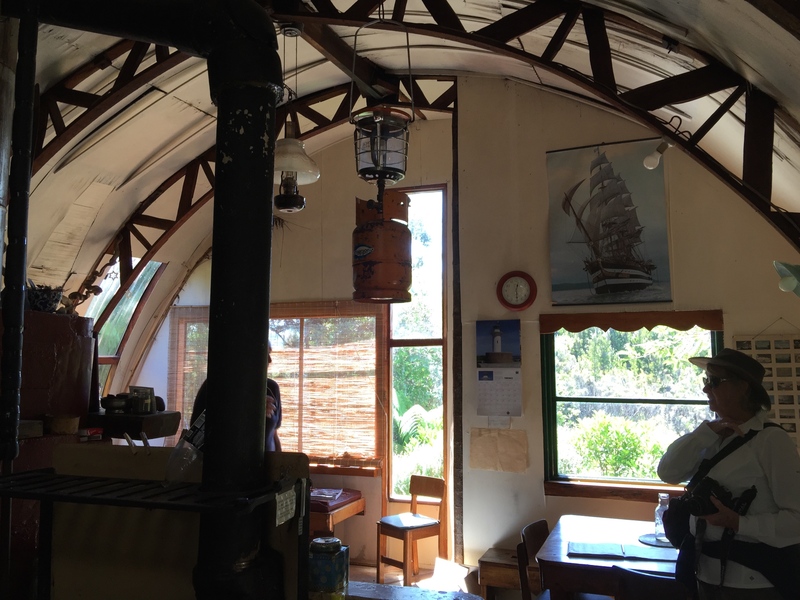 The Willsons lived and worked here mining tin for many years and I loved their house: an open area starting with the kitchen and then the living area. The bedroom is above, up steep little stairs and the room would receive heating from below and the chimney flew passing up from below. The shower is downstairs, dropped below the living area and there is a large pantry off the kitchen to keep all the home preserved (and brewed) food and drink. Then, a visit to Deny King’s house. 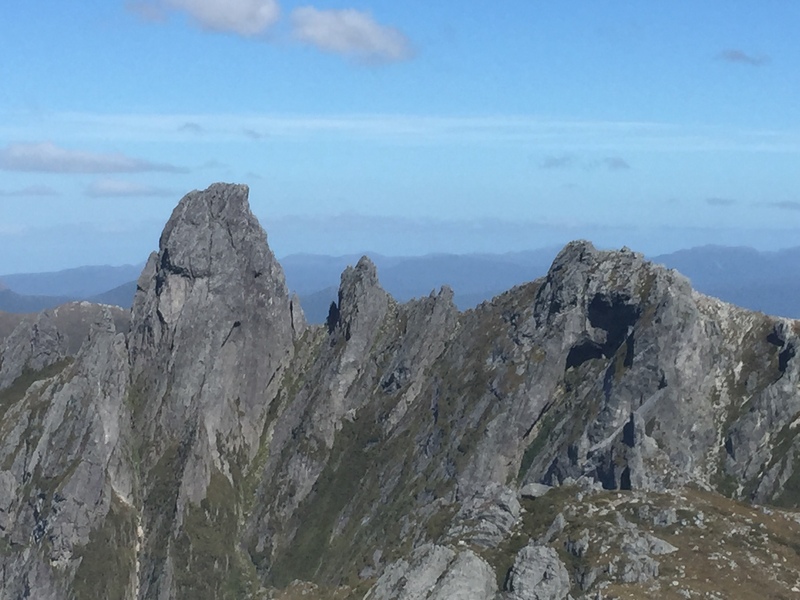 He is probably the best known person who lived at Port Davey, having grown up mining with his father elsewhere in the South West. A rugged existence and everything I’ve heard or read of him emphasises how enterprising, creative and hard working he was. 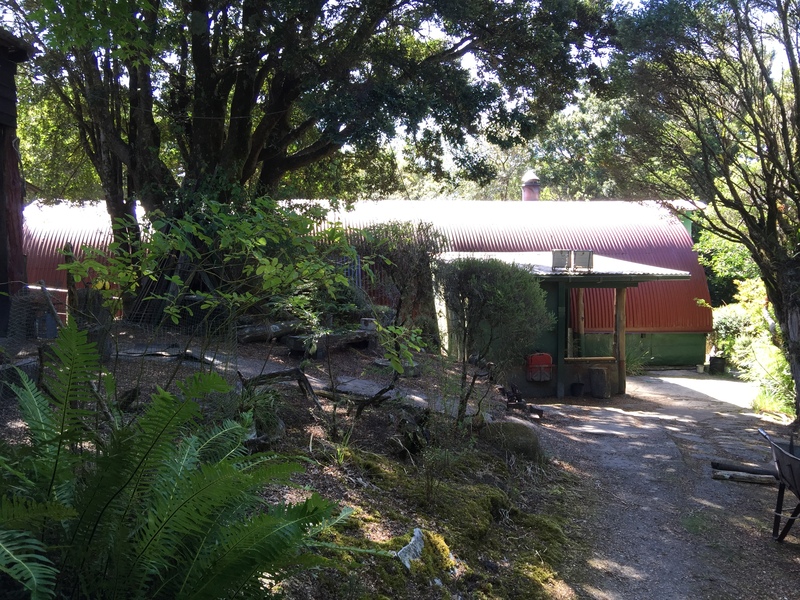 His house looks like a modified Quonset hut built with curved plywood with some extensions. I’d always envisaged his house in the open, in a wind swept scrubby area. 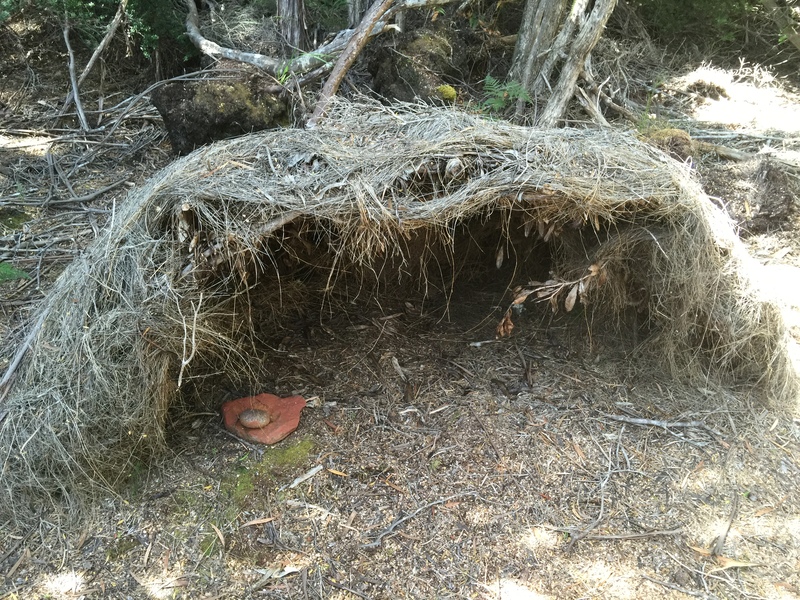 An early photo suggests this was accurate but trees and shrubs surround it now. Nearby is the remnant of a very large vegetable garden. Walk into the house: large open area to the right, a sitting area; a partition down the middle of the area to the left with a kitchen as you walk in off the porch; turn left after the partition down past bedrooms. The upright piano, saved from a very serious fire in the 30s after being buried in advance, is in the room at one end. Storage is everywhere, including the ceiling space. 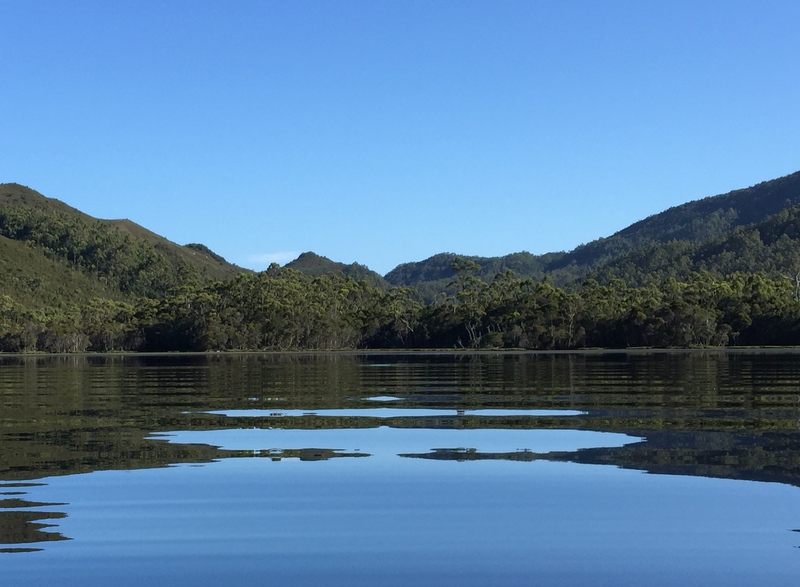 Next, after this short look around Melaleuca, off in a small boat with our gear and food to the camp. 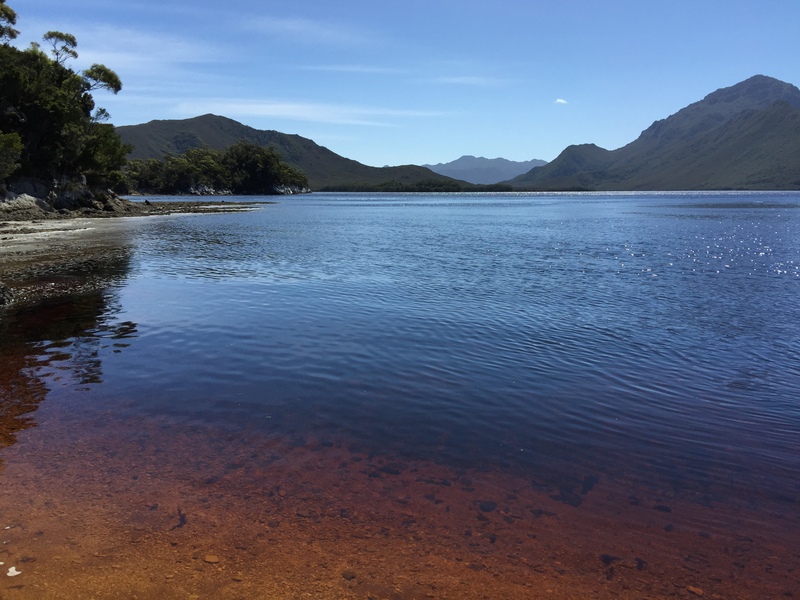 The water is tea coloured, full of the tannin from the vegetation in the region, and tidal as part of Port Davey. 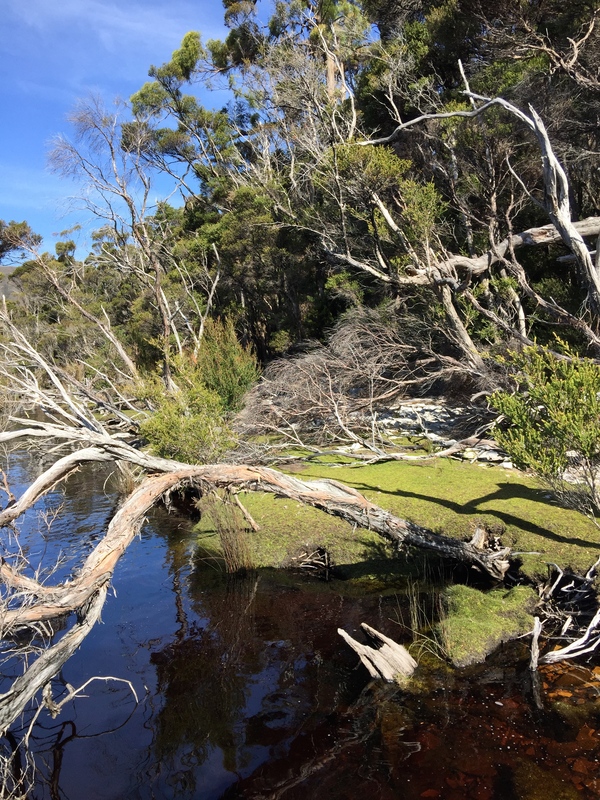 See the lovely short wallaby and potaroo eaten vegetation beside the water, the melaleucas with their tortured roots nested into the waterway. 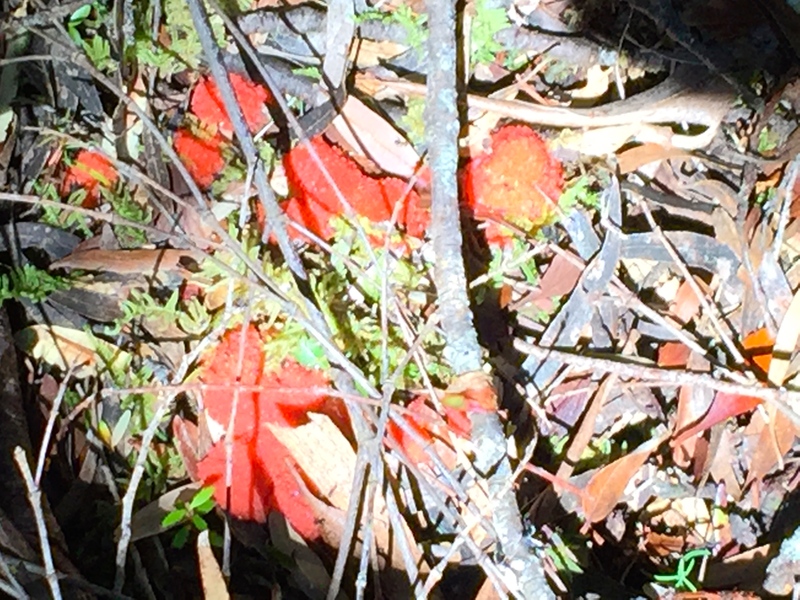 And the red fungus at one stop in the undergrowth behind the shore. We finally arrived at the camp. 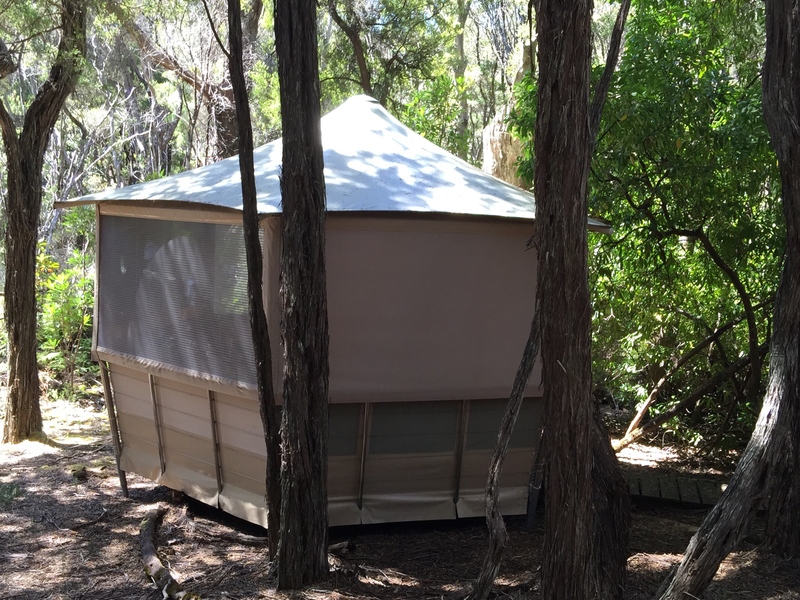 Permanent tents within the bush, set back from each other to maximise privacy and connected by duckboard paths. 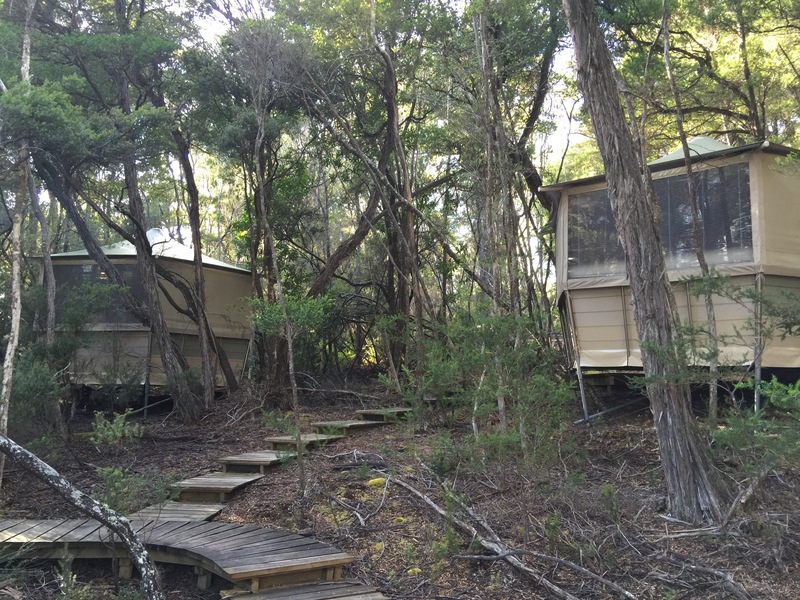 Two central areas: one near the water, an open air location great for afternoon drinks with bisuits and cheese; and the other on the opposite side of the camp with a dining table and a kitchen. 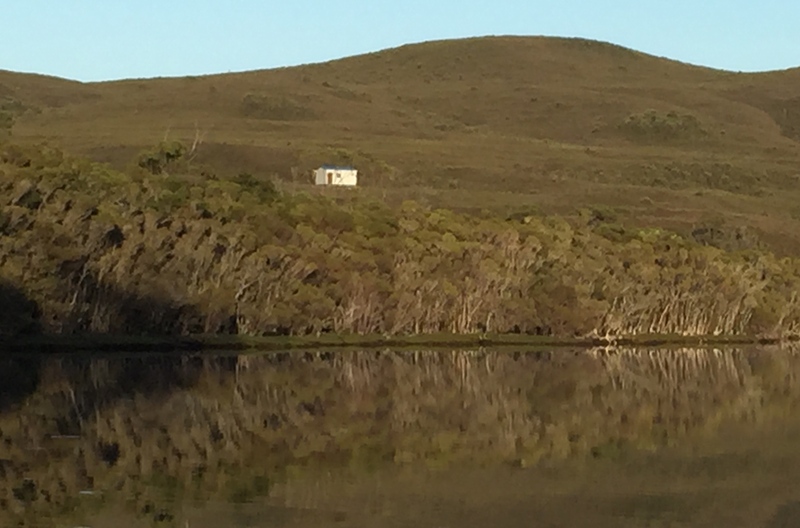 A shower and toilet block was further inland, a convenient distance, from these other structures and the tents. 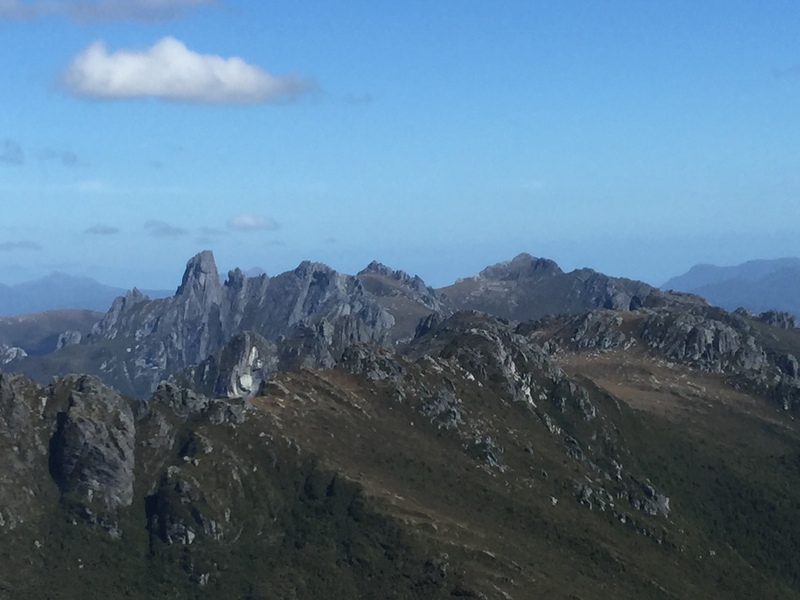 Some shots from the camp looking down and out Port Davey. 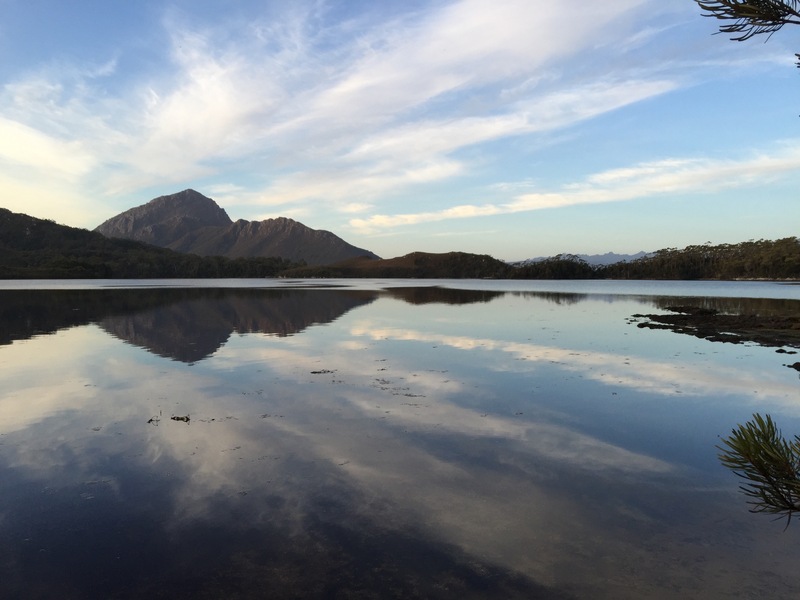 The reflections were particularly excellent on our first evening. 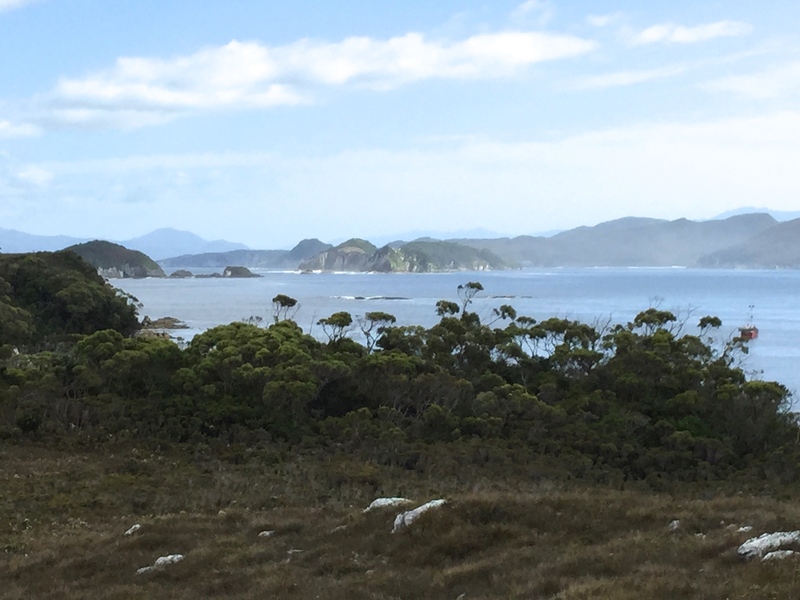 Near the tent camp is the house erected for MONA, in memory of Critchley Parker, who died exploring the Port Davey region in 1942. He was looking for a place to establish a settlement for Jews displaced from Europe. 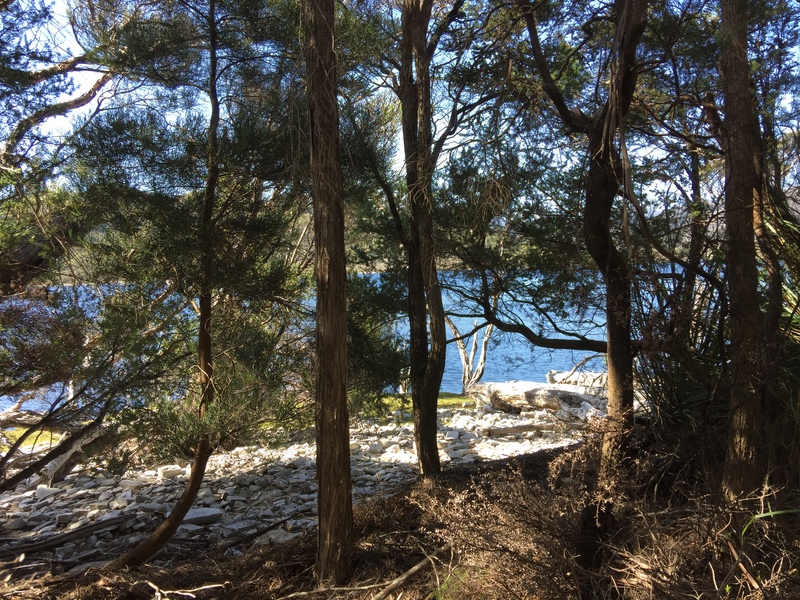 The MONA art work is a small green and white house, perched in the yellowish browny green scrub and undergrowth. It intrudes into the landscape and clearly doesn’t belong to the region. The point I guess the artist was making was that few people could successfully live in such a rugged wilderness. Critchley inadvertently proved how difficult it is, dying in the region with his body not being found for weeks. My shots do not do the installation justice. Would that I’d remembered to take a memory card for my camera! Thank heavens for an iPod 6. 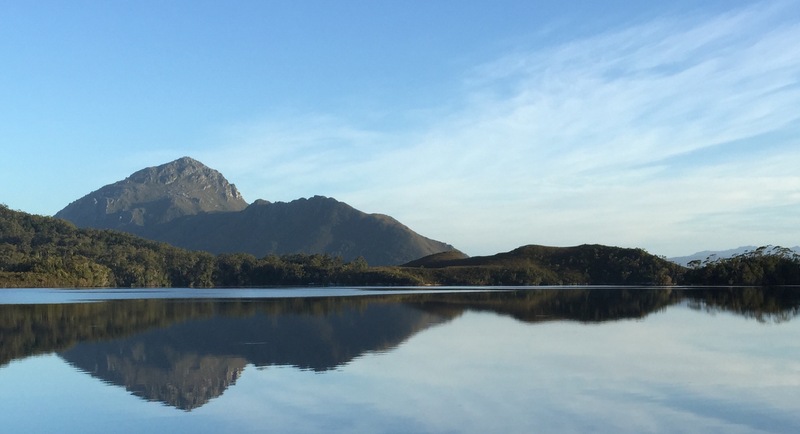 The shots below show a little of the rugged, harsh, beauty of the area, the magnificent reflections, the sharp rocky edges of mountains highlighted by the sky, etc. 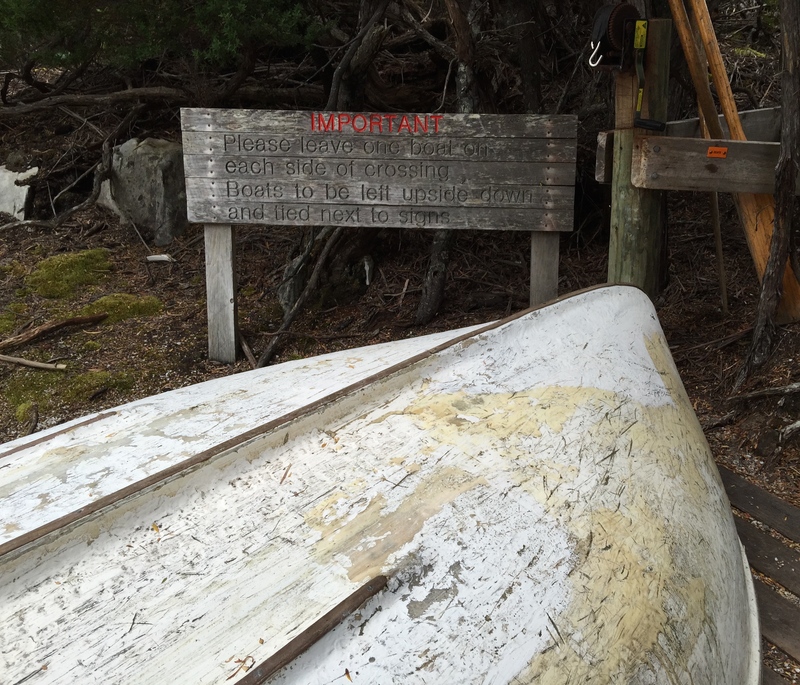 One shows the boat, one of three for crossing Port Davey on one of the tracks. 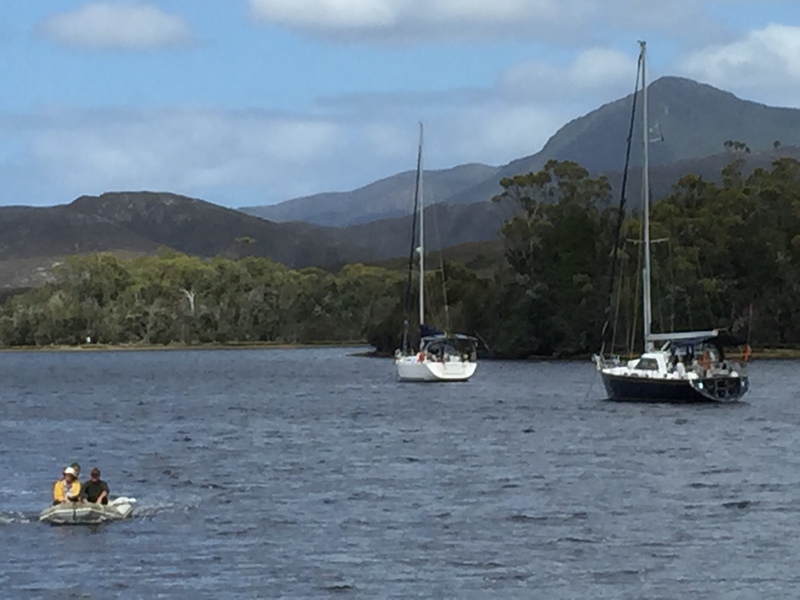 We headed out to Bathurst Harbour the next day, through the narrows. 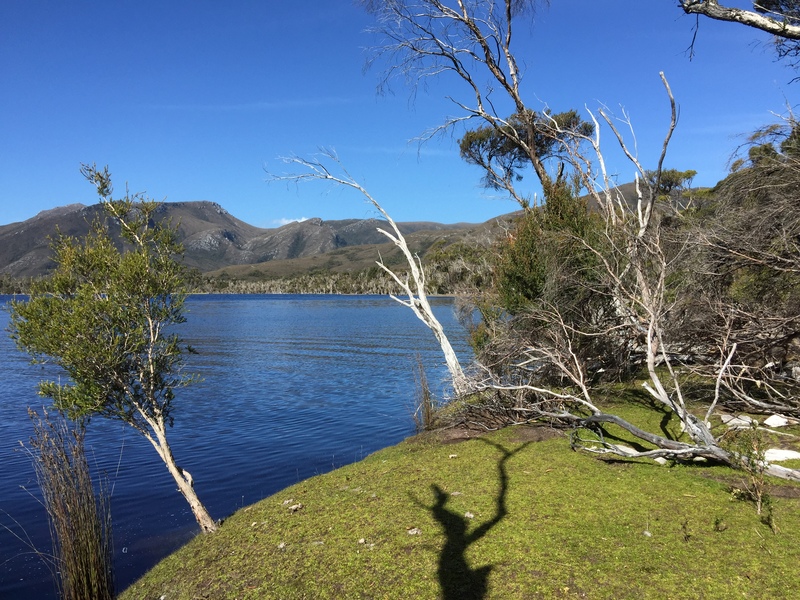 This area is apparently very deep, not surprising given the volume of water that passes through it daily in and out of the greater Bathurst Harbour. On the way you pass the deep section used by Deny King when bringing very large mining equipment into the region. The boat had to be alongside. 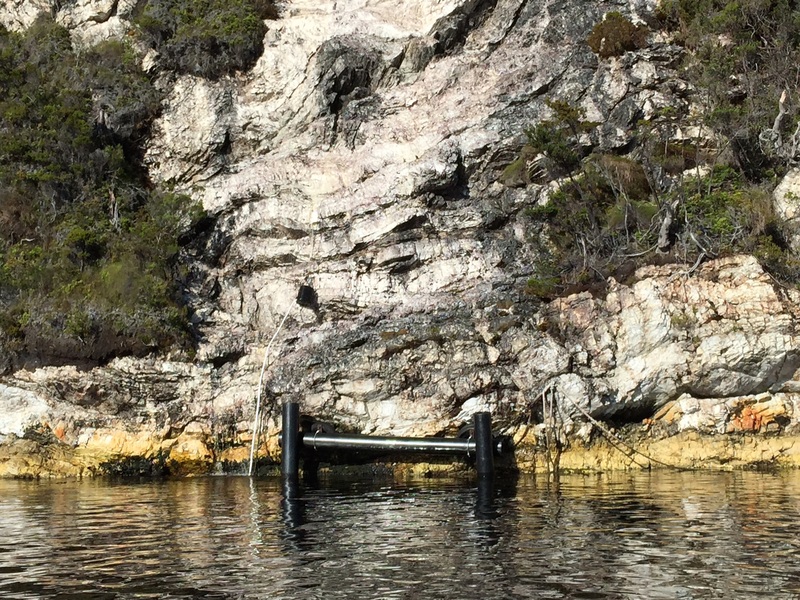 Sounds easy but moving heavy equipment off the boat and to where it was needed could take days with it being repeatedly bogged there, and along the way, in the heavy, wet, peat soil. 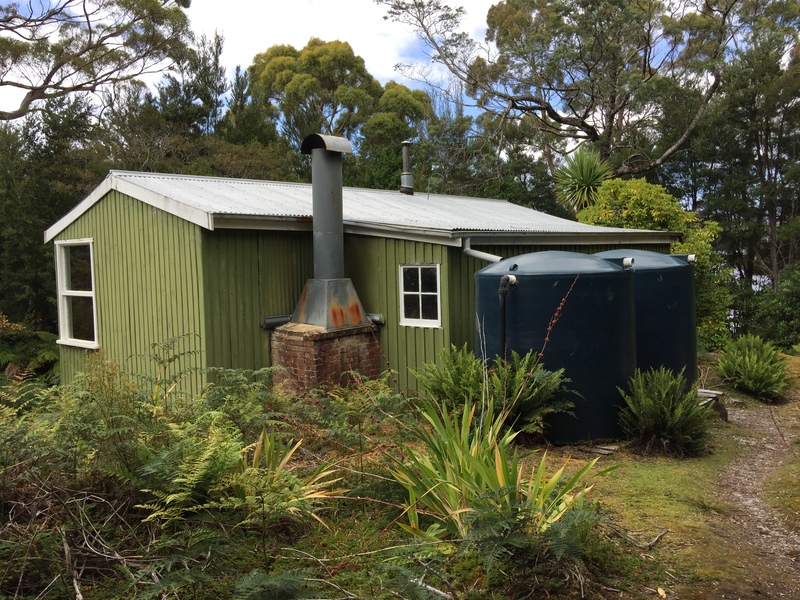 Sailors in the Port Davey area can get water from a permanent source, a spring falling into a bucket with a hose hanging down for access. 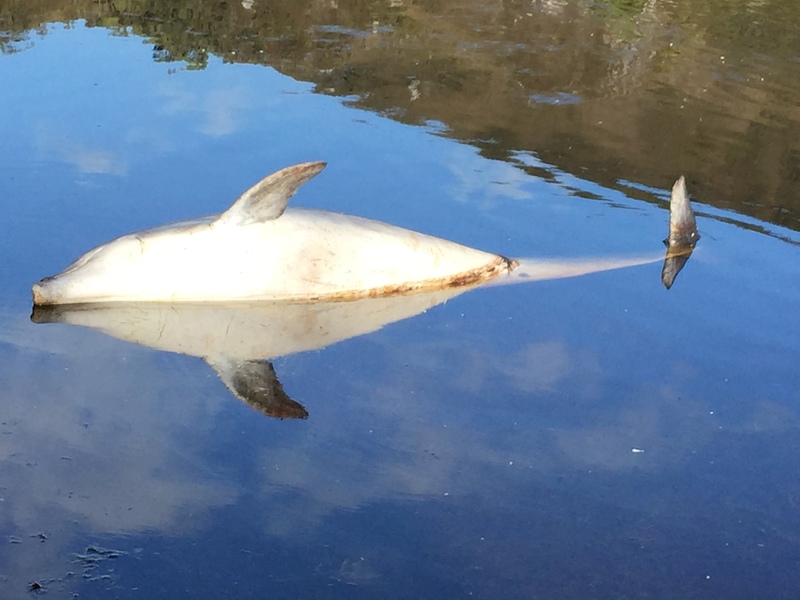 We saw a dead dolphin. From the distance it wasn’t clear what it was, if a dolphin or something else. From the boat we walked along the shore to it. Part of its top beak had gone and it had a number of healed scars. Since it didn’t smell and wasn’t bloated it possibly had not long been there. Meanwhile the weather was still wonderful, warm and sunny. A few high clouds but the best possible weather for that region. A change was expected later morning on the second day. 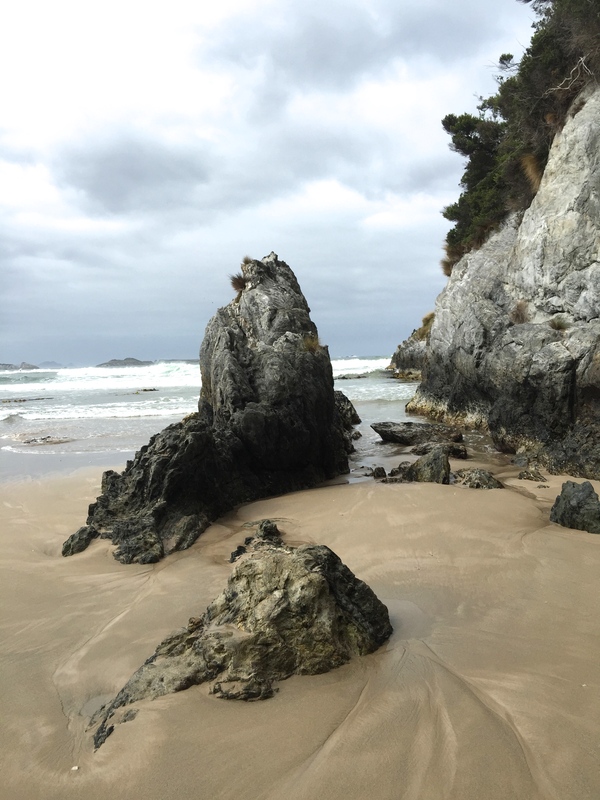 And, when we returned to the boat after walking across from Spain Bay, the weather deteriorated rapidly. 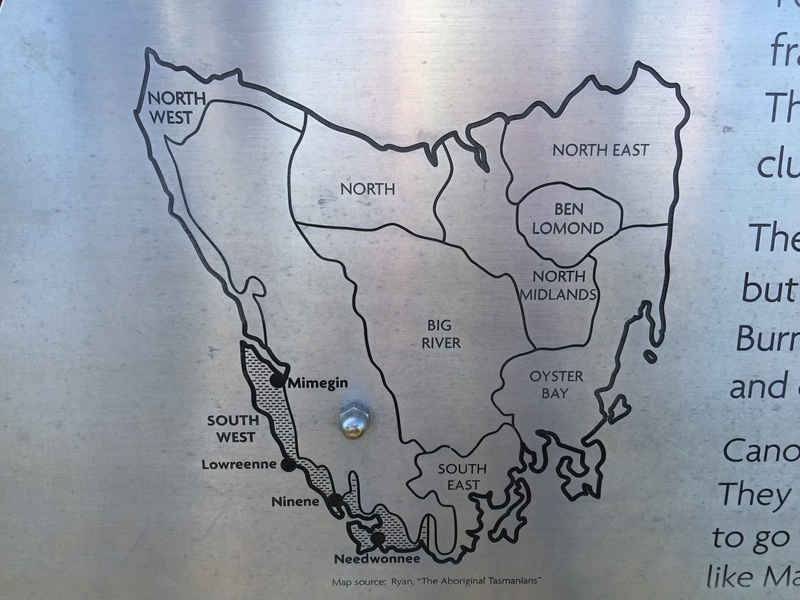 Pity, as I’d have liked to have had the time to visit an aboriginal cave and middens further along the beach. Still the walk in was excellent. A narrow track, at times, well over a metre and half high vegetation so people ‘disappeared’ from sight. 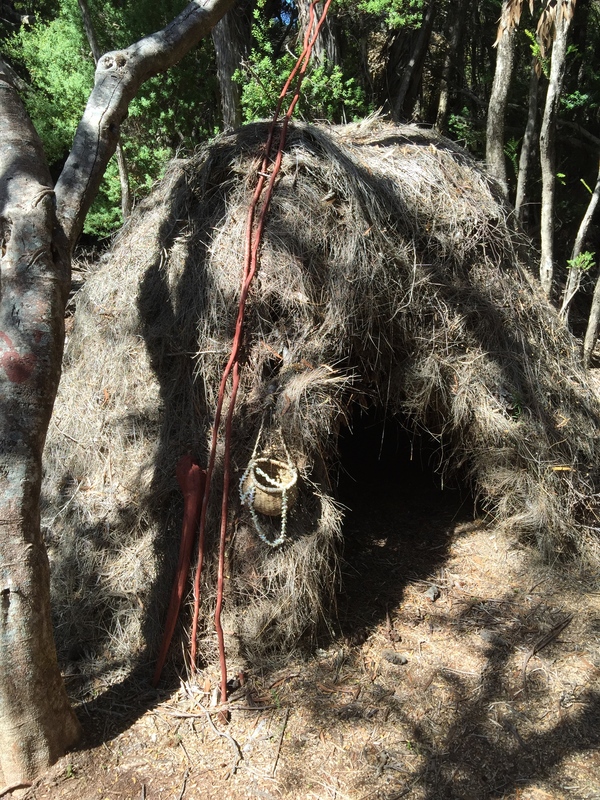 And then easy, with short vegetation only. 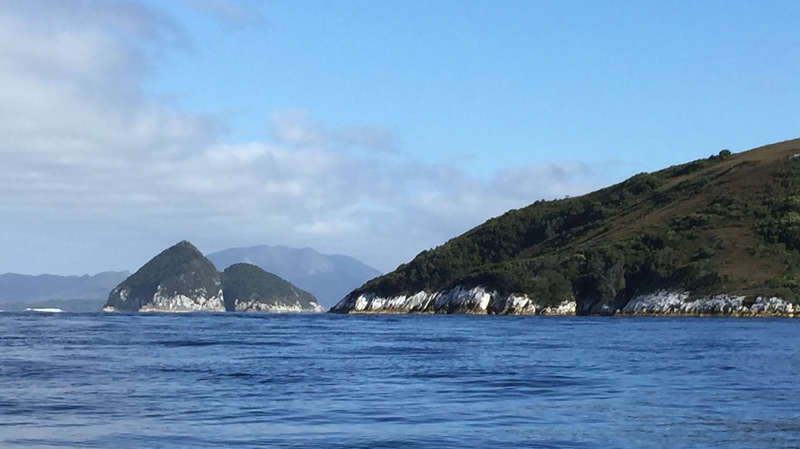 We passed inside the Breaksea Islands, rocky outcrops that form a bulwark to Port Davey. The water on their western side is rough, heavy, white and surging. On the lee side, their eastern shore, it is considerably calmer. The photo shows them from the vantage of the plane on our return voyage. The weather improved once we were back. So, time to eat again. The food served on this trip was very good, ranging from cold meats including smoked salmon and quail, local cheeses, excellent green and tabouli salads, to a nice vegetable soup. One breakfast option was Greg’s eggs, a bean mix in a ramekin with an egg on top. Very nice. Throughout the day we were regularly offered water, interesting nut and fruit bars and apples and oranges. Food was very good and the service efficient and excellent. 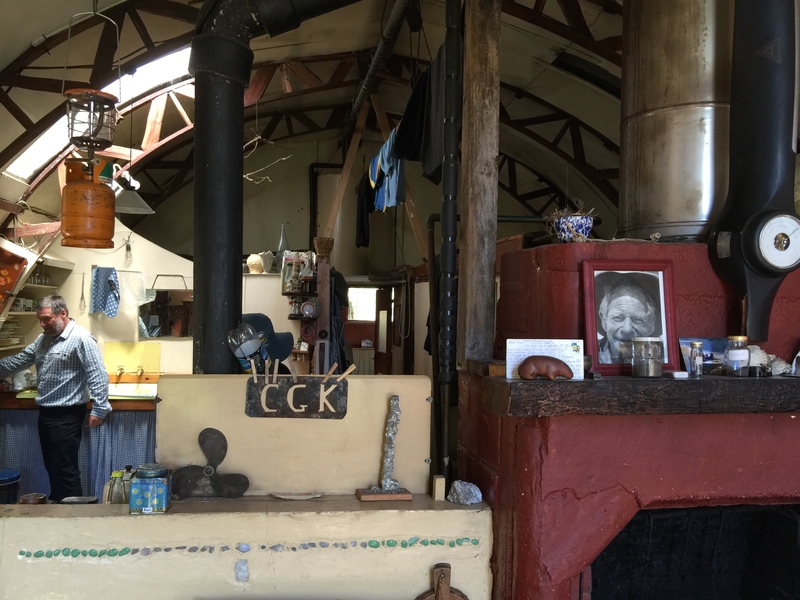 On our third morning we travelled over to the house Deny King’s sister and fisherman brother in law, Win and Clyde Clayton. 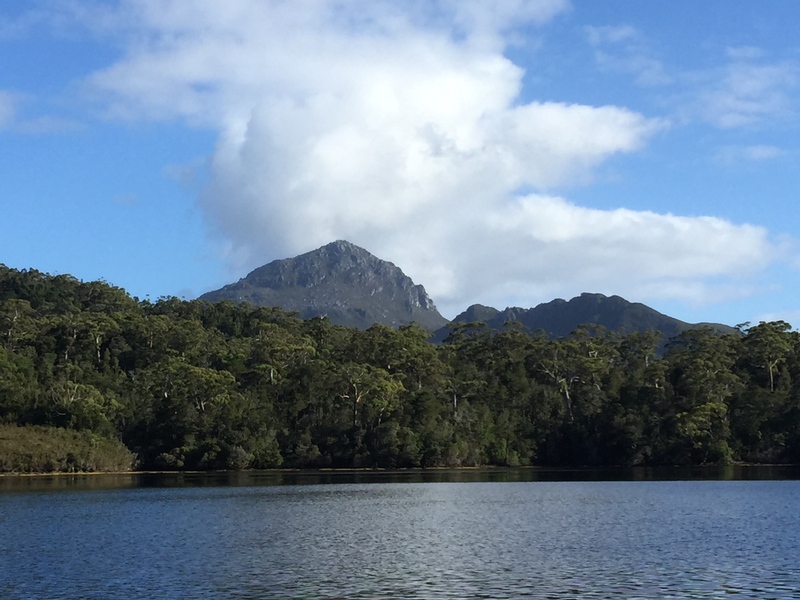 This small green house is maintained by a ‘friends’ group’ and is under the auspices of Tasmanian National Parks. I loved this house as well. Small, minimum rooms, two bedrooms, a bathroom and an open kitchen and living room heated by a fireplace and with a wood stove. The alcove had laundry facilities. 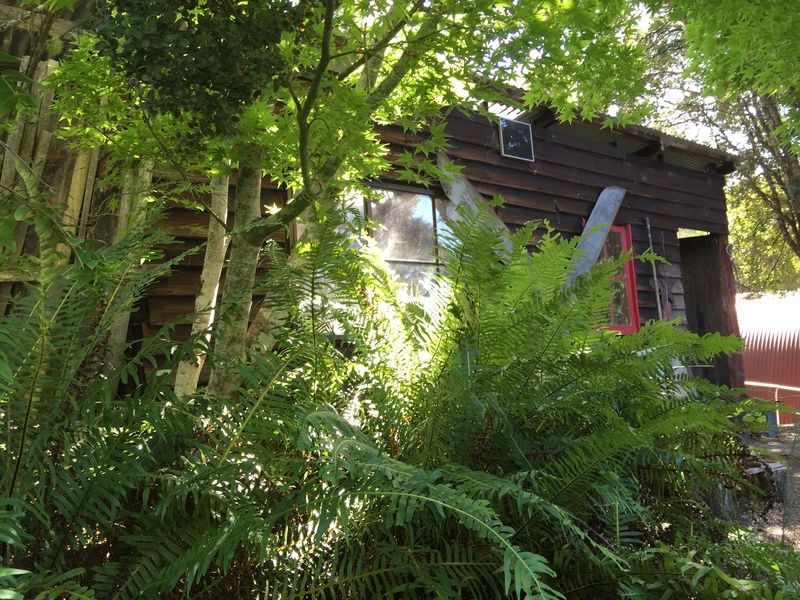 The house was once surrounded by vegetable gardens, now just the outline of some beds and few remnants of rhododendrons remained. We walked up the small mountain behind this house. 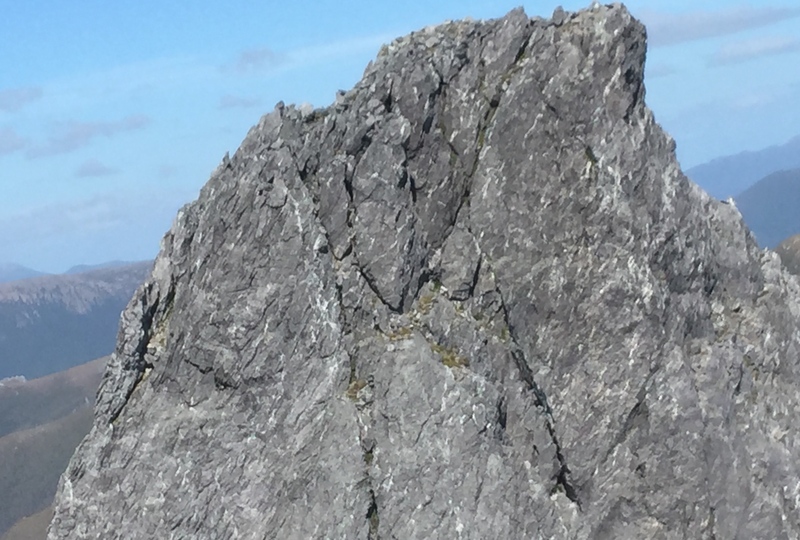 The views were spectacular, as the panoramic shots suggest, with the weather again clear and sunny with some scattered high cloud. 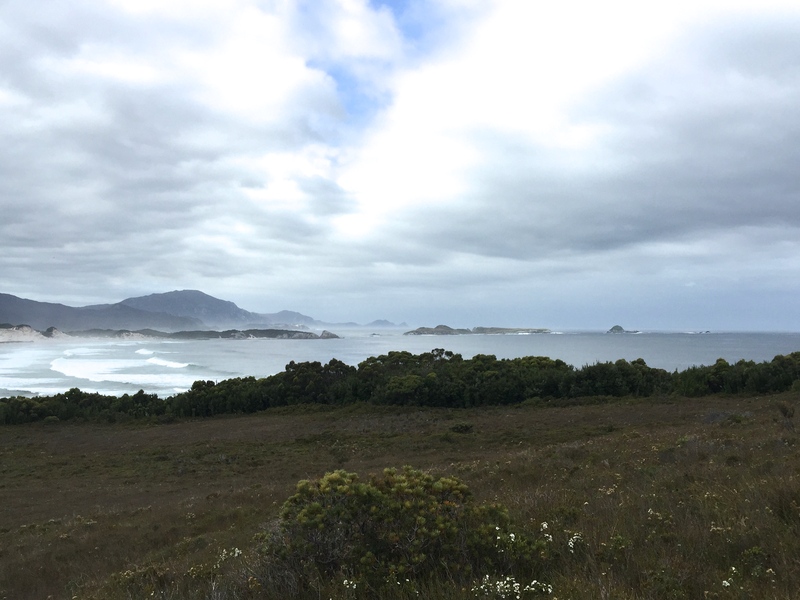 We saw a few boats as we travelled around Port Davey. 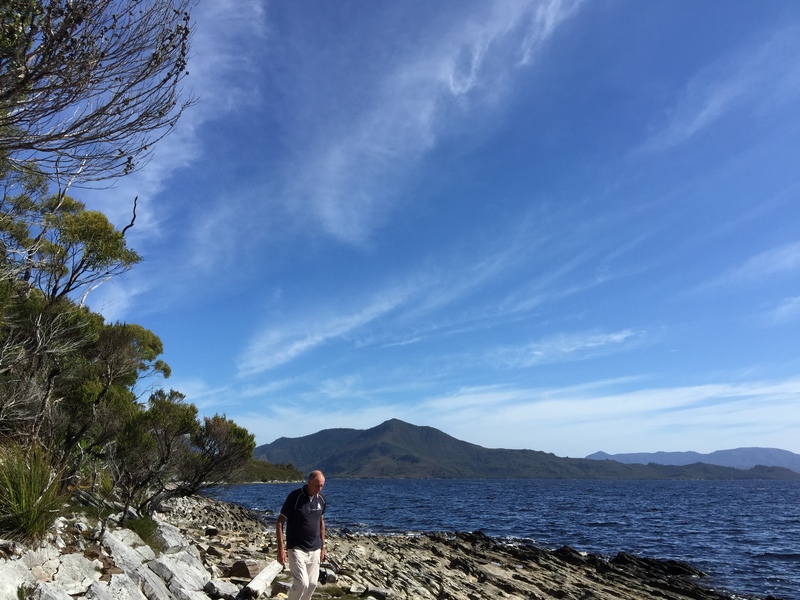 Next, back to Melaleuca to fly out. 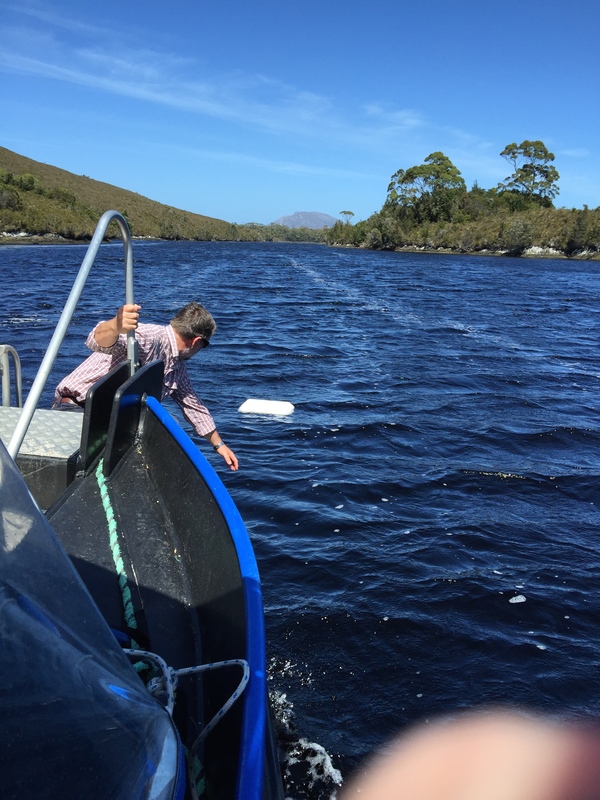 First an unplanned ‘man overboard’ recovery as the top of an icebox flew off into the pristine tannin coloured waters of Port Davey. Good recovery Pete, on the second try! 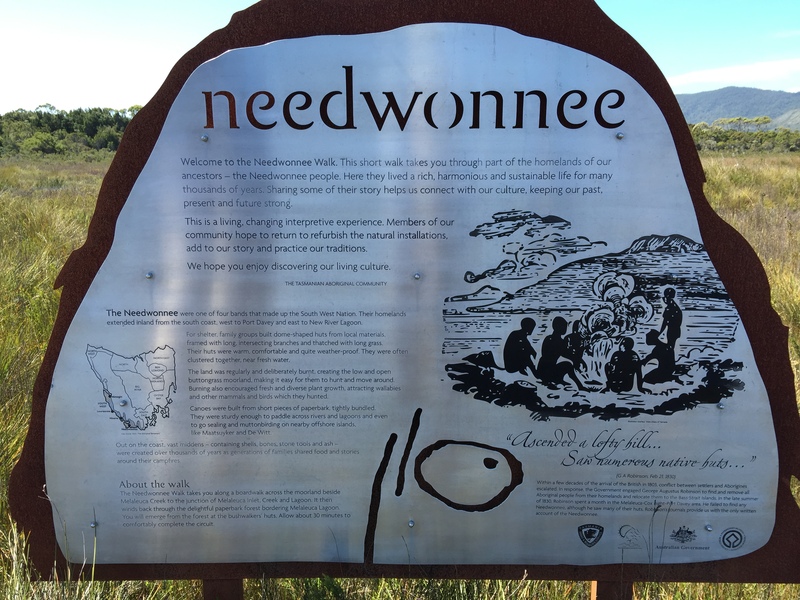 At Melaleuca we all walked the Needwonnee track, celebrating the aborigines who had lived in the area until the 1830s. 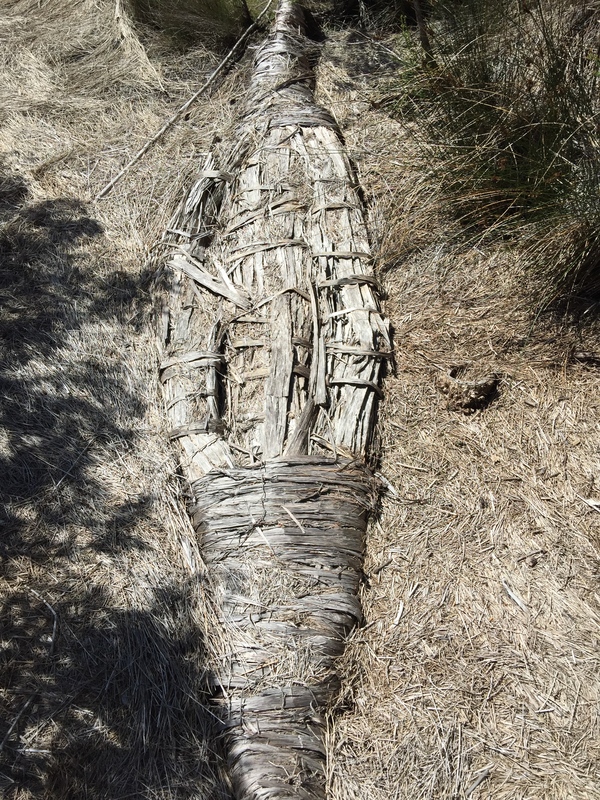 Exhibits on the walk included 2 styles of shelter and a bark canoe. A more recently built one is in the Hobart Museum. 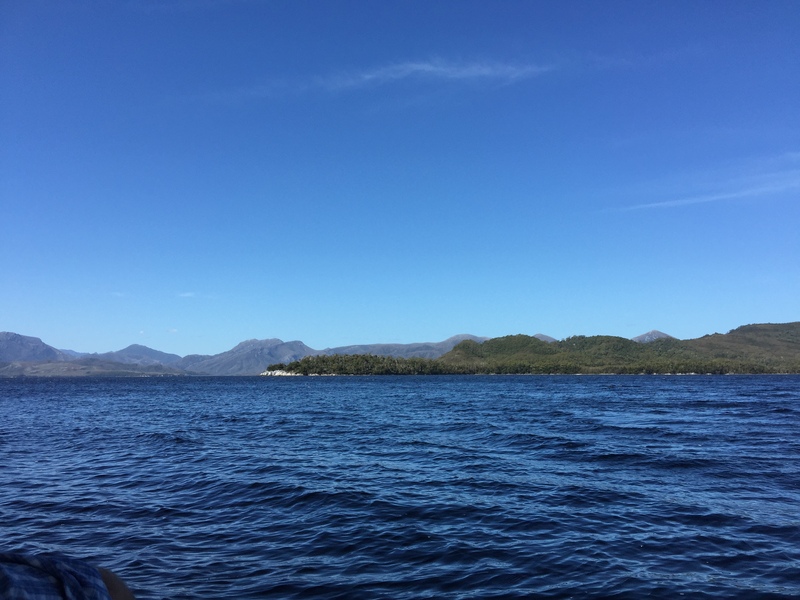 We left Melaleuca, flying out in a more northerly direction than we came in. 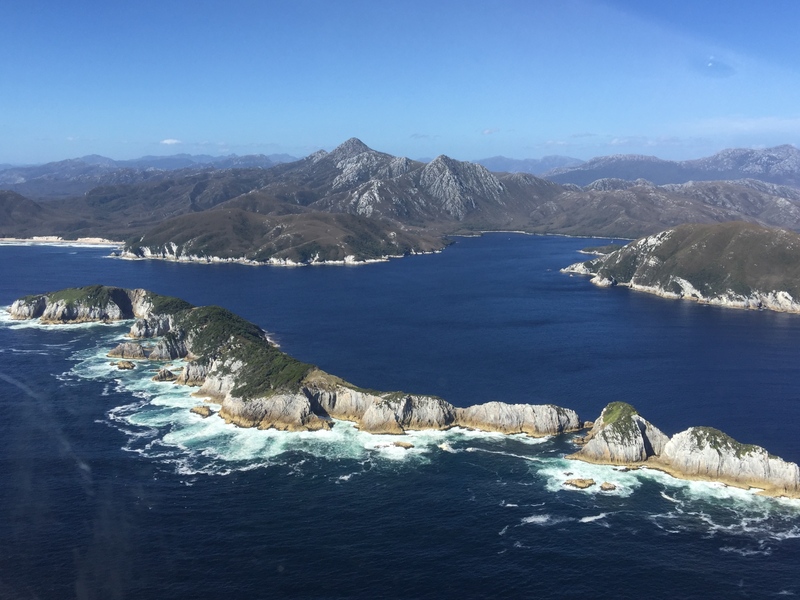 We flew down Port Davey, over the Breaksea Islands (see header photo) that break the fierce southerlies that come straight from South of Africa, over the Arthurs with the steep sides splattered by rock, and with small tannin coloured lakes near the tops of the peaks, looking like crater lakes, very near Federation Peak and finally over Geeveston and the beautifully green Huon region, over Hobart and back to Sydney. Would I go again? Yes. Irrespective of the weather forecast. I’d love to see the area in different weathers. The weather this time was great for a first trip in, to see the hills and mountains around us, to see the quality of the reflections. No, I don’t expect that is the experience all travellers to the region in a February will have. Our guides, Greg and Peter, were truly excellent. 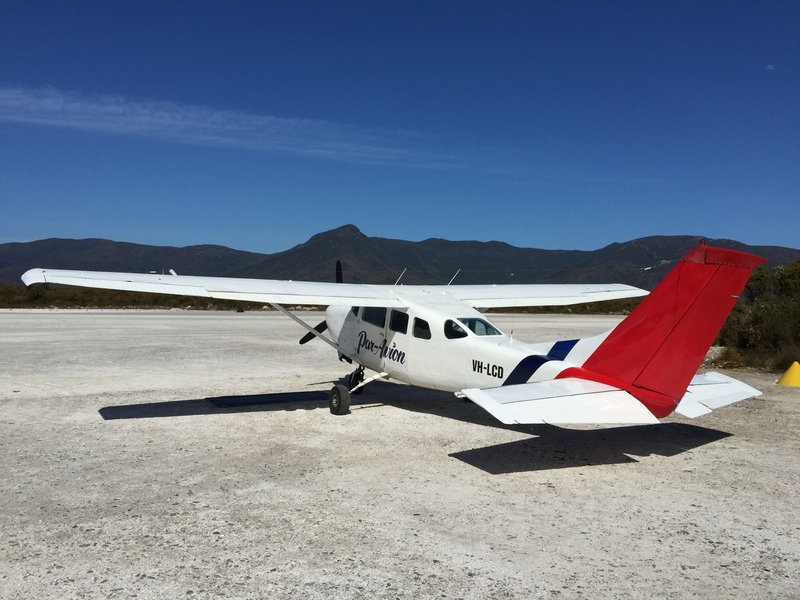 I highly recommend Par Avion South West Overnight Experiences +++ and thank the guys for a great trip.